Boston firefighters responded to Hemenway Street Saturday afternoon. 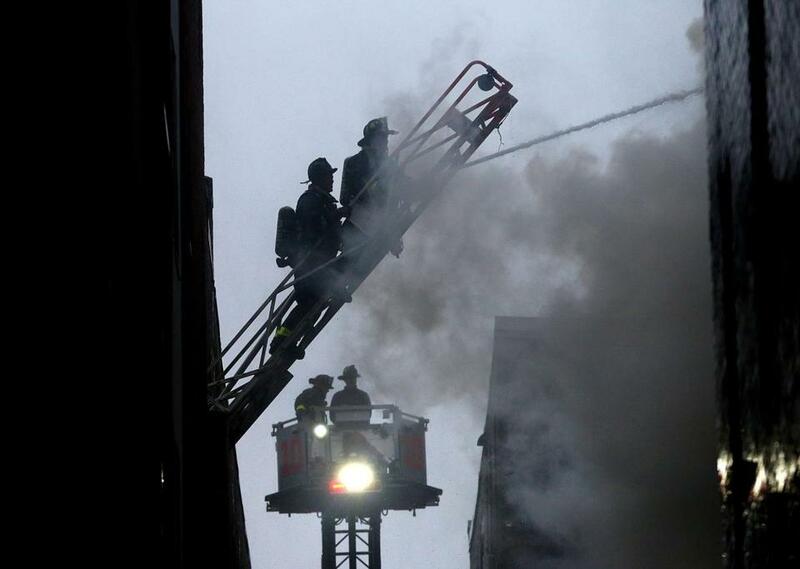 Battling heavy rain and shifting winds, more than 100 Boston firefighters fought to contain a seven-alarm blaze that injured 11 people at a Fenway apartment building Saturday afternoon rescuing several people, officials said. 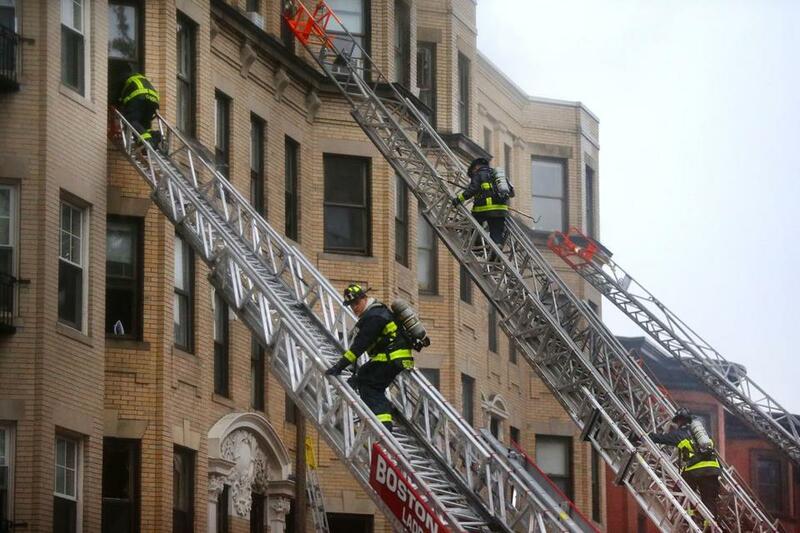 Fire crews used ground ladders to rescue people from 104 Hemenway St., which was destroyed by the fast-moving fire that sent roaring flames and thick smoke into the gray autumn sky. The fire also displaced nearly 100 people, mostly students from Berklee College of Music, Emerson College, and Northeastern University who lived in the five-story building, officials said. Mayor Martin J. Walsh said the city is working with the colleges to help students find new housing. “We’ll make sure everyone is housed in the near future,” Walsh said at an early evening press conference held about a block from the scene. 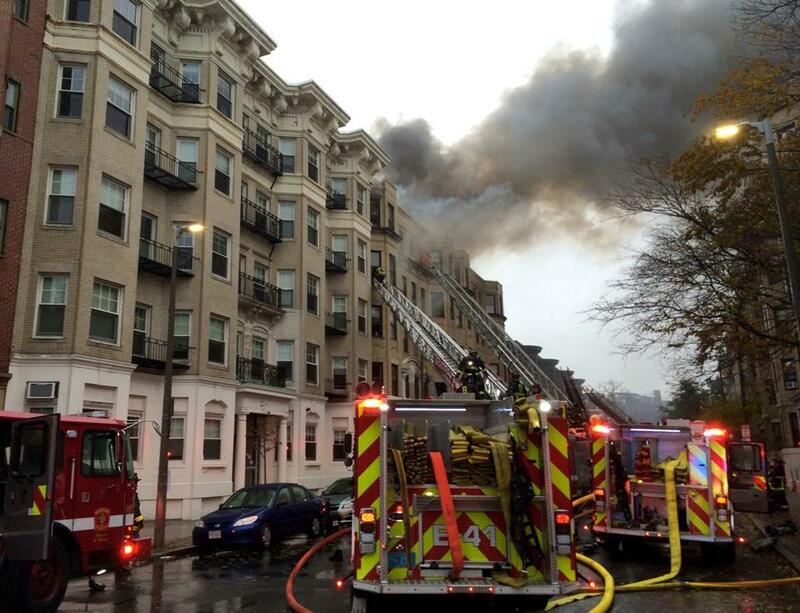 Nearly 100 people, most of them students, were displaced after a fire on Hemenway Street. “It’s a very scary fire here,” he said. Northeastern University officials issued a statement saying that they are making plans to place students affected by the fire in campus housing. Berklee officials in a statement said they are contacting students living in 98 and 104 Hemenway St. to ensure they have accommodations. Emerson College officials could not be reached for comment. Firefighters responded at 3:17 p.m. to an alarm at the five-story building, where heavy fire was already underway on the second floor, Fire Commissioner Joe Finn said. 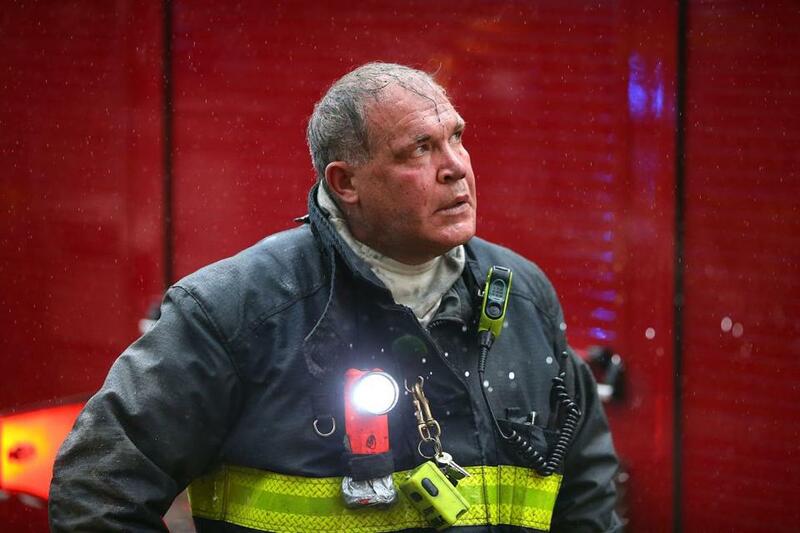 The roof soon collapsed and conditions rapidly deteriorated, forcing firefighters out of the structure shortly before 4 p.m.
Fire crews were hampered by a nor’easter that swept through Boston Saturday. “It’s very difficult. The winds keep pushing the [smoke] one way, and then the other,” Finn said. A pair of firefighters were transported to local hospitals with non-life-threatening injuries, he said. Two other firefighters were treated at the scene for smoke inhalation, as well as six residents of the apartment building and an elderly neighbor, said Marc Sanders, a Fire Department spokesman. The fire, which quickly grew to multiple alarms, ripped through the brick building, which appeared to be a total loss with damages estimated in the millions of dollars, Finn said. City property records show the building is owned by Bobson Residential LLC and has an assessed value of $4.2 million. In a statement Saturday night, the Copley Group, which manages the property, said it is working with fire officials to determine how the fire started. “Our priority is the safety of our tenants and ensuring that they have temporary housing until we have an opportunity to assess the building,” the statement said. The fire appears to have originated on the second floor and the cause is under investigation, but is not considered suspicious, Finn said. He blamed a “lack of sprinklers” for difficulty fighting the fire though he said smoke detectors were working. At least a half-dozen fire trucks lined Hemenway Street. Ladder trucks were extended to the top of the building. At times, as many as 10 hoses shot water inside the building. Jade Sal, 20, said she was among the residents rescued. Sal said she and several neighbors were helped through a window from her third-floor apartment. When Sal first noticed the fire, she tried to run down the stairs and escape outside, but was blocked by smoke. “There was smoke coming from both staircases going down,” said Sal, as she watched the scene from the sidewalk, wrapped in a firefighter’s jacket. Three nearby apartment buildings at 98, 102, and 108 Hemenway St. were also evacuated Saturday, and it was unclear when those residents — who are also mostly students — will be able to return, Sanders said. The fire at 104 Hemenway St. was able to spread into the top floor of 108 Hemenway, he said. 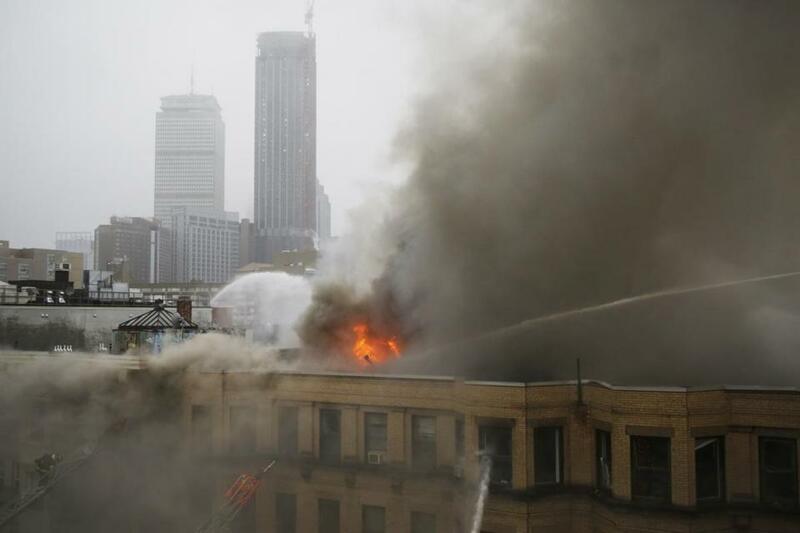 Flames could be seen on the roof of the Hemenway Street building Saturday afternoon. Boston firefighters responded to a large apartment complex at 104 Hemenway St. during heavy wind and rain Saturday. 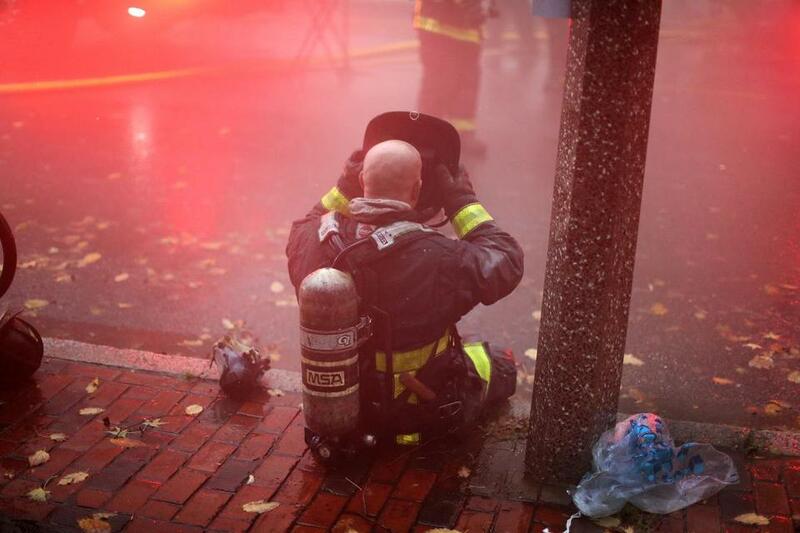 An exhausted firefighter took a breather at the scene. 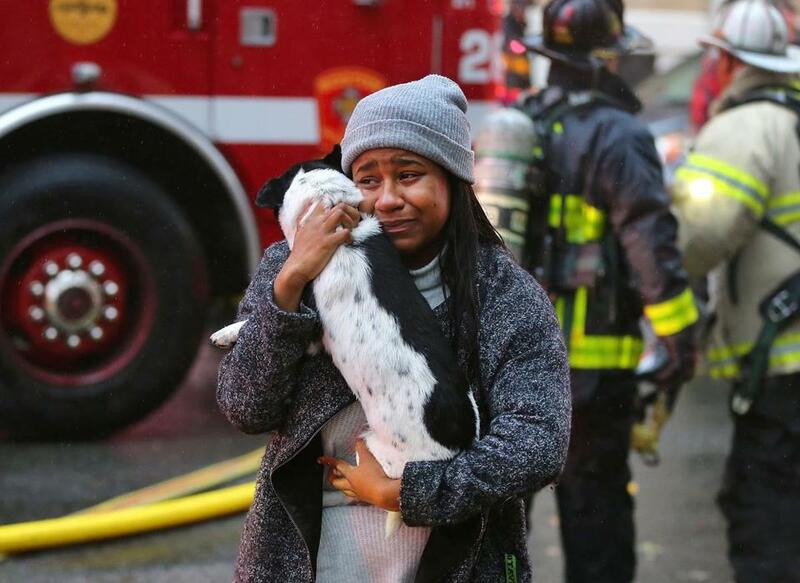 Garri Paul cried as she was handed her dog, Jax, by a firefighter who rescued him inside her burning apartment. Firefighters climbed aerial ladders at the front of the building. 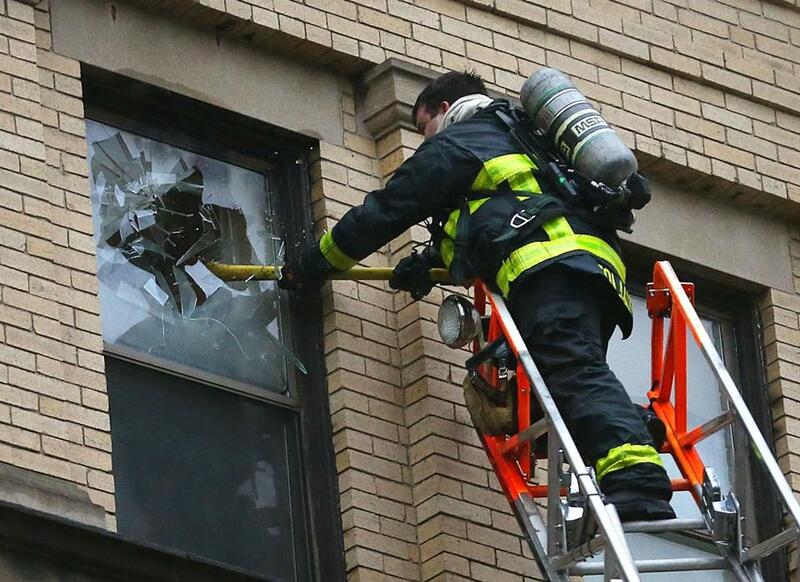 A firefighter smashed a fifth-floor window. A firefighter took off his helmet at the scene. 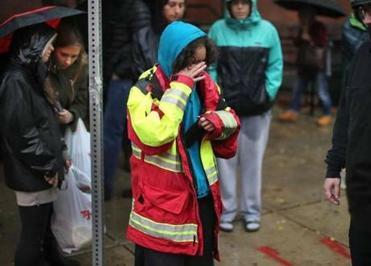 A resident overcome with emotion stood under an umbrella. Alana Levene can be reached at alana.levene@globe.com. John Hilliard can be reached at john.hilliard@globe.com. Lucas Phillips can be reached at lucas.phillips@globe.com.